Hey friends! Happy Wednesday! 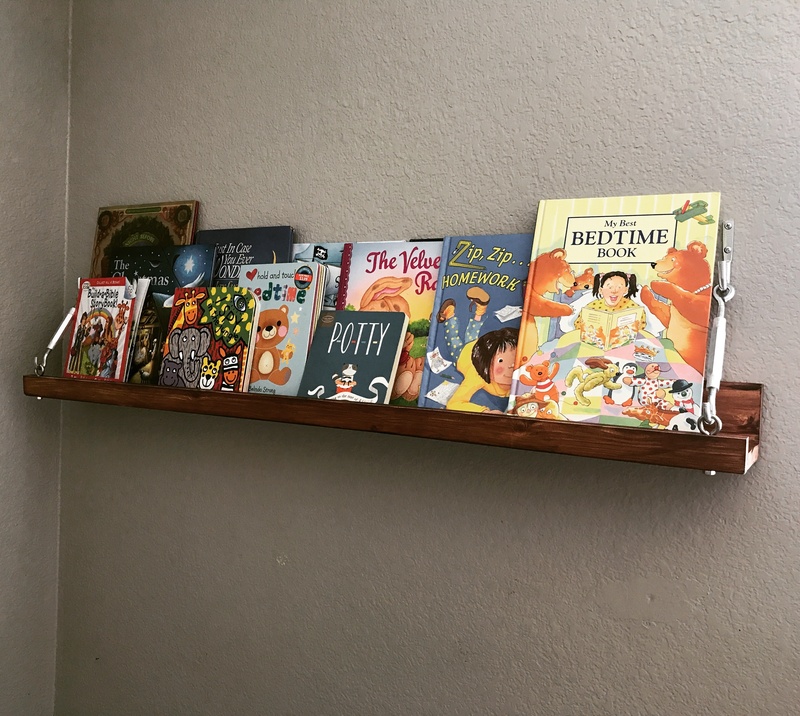 Today we are sharing our latest YouTube video where we show y’all how we built these super cute (and even simpler) DIY $10 turnbuckle shelf! How fun are those? I built these for my boys’ new shared room. I am currently 30 weeks pregnant and counting down the days people… You mamas totally understand I know! I can’t wait to squeeze him, and walk normal again 😉 ! So, before we get started, check out our video HERE or below! Now these shelves are ALL about the hardware. You can find everything you need to make yours at the hardware store, and I am linking to everything on Amazon too below, because who doesn’t love Prime and free shipping? The assembly of this shelf is crazy easy guys! First step is forming your “L” with the two 1×4 boards. I chose to connect mine with pocket holes, but you can glue and nail yours and it will work just fine! You want all of these pieces cut to the size you want your shelves to be. You can see I added 3/4″ pocket holes down one side of one of my 1×4, and these will attach to the other 1×4 to create my “L”, and I will nail and glue the 1×2 lip. Make sure to add a line of wood glue between all your joints on these. At this point, you add your holes to the 1×2 board just as we did in the video. Remember, you want them about 1.5″ from each side. Believe it or not, you are done with assembly and ready for stain and paint! We stained the shelves using Varathane Briarsmoke. We also spray painted all of our metal hardware using a flat black spray paint by Rust-Oleum. Once everything dries, you are ready to hang it up! Be sure to use anchors if you aren’t attaching your hardware or shelf to a stud. I used speed anchors (which I love so much) to anchor my hardware since it wasn’t going to be attached to a stud. I marked on the wall where the holes of the rope hooks would line up and used my drill to insert the speed anchors. To attach my shelves, I marked my studs and used 2.5″ Spaz screws to drill through the back of the shelf and into the stud on the wall. Once the shelf and rope hooks were attached, I added the eye bolts. Now I added both turnbuckles! Don’t worry about any chips on the black hardware! You can use a small paint brush to go back over them with flat black acrylic paint and you won’t ever know you did! They are all finished! I love them so much! I found the storage seats at Container Store HERE and love, love, love them. They are so sturdy and my boys can put their toy inside of them, and they come in lots of colors! Thanks again for stopping by guys! Hope you love them, and build them! Let us know if you have any questions at all! Are these each 3ft. Long? I am new to all of this and excited to start my first project. So how do i make the pocket wholes an hope that is not a stupid question.? https://uploads.disquscdn.com/images/e88665df2f2e8a364ad3df52f00f00a8e06c5decbdfca986ac6236e73cb8aa64.jpg Made the shelf for my boys room and they love it! ???? LOVE these!! I made ledges just like these for my living room wall, but I absolutely love the addition of the turnbuckle. I might need to do this for another room in my house! Love these! Would the turnbuckle still work with a deeper shelve like a 1×6?